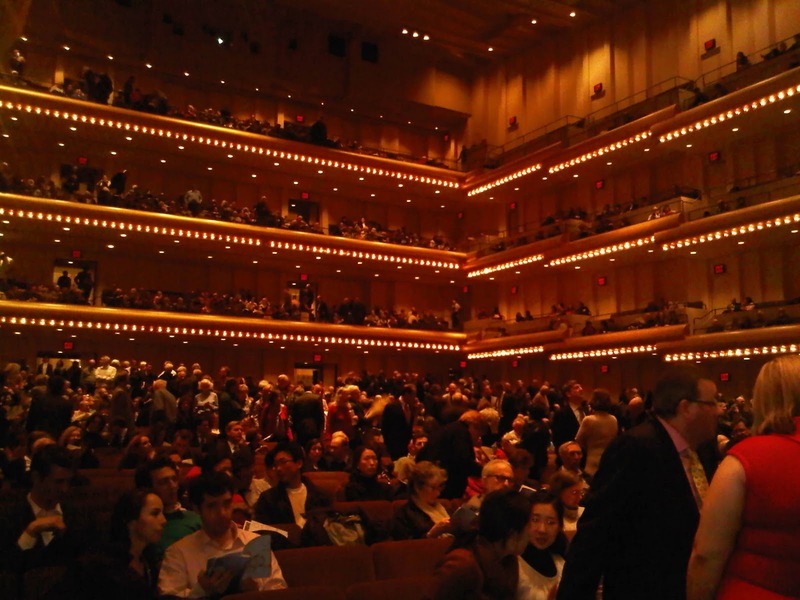 On Friday night, January 28th, Noah and I attended the New York Philharmonic concert featuring Karita Mattila. The Phil played Beethoven's Symphony No. 8 in F major, Op. 93. What a joyous piece of music! Maestro Alan Gilbert conducted by memory. We were seated on second row, far right, so we were able to watch his face when he turned. It was exciting to see his expressions. Karita Mattila joined for Beethoven's concert aria "Ah! perfido," Recitative and Ara, Op. 65. She looked dazzling in sleeveless hot pink and was dripping with diamonds (see picture here by Hiroyuki Ito for the New York Times). Although not my favorite, it was sung with beauty and gusto. It's a moody piece - Noah and I discussed that it was similar to Erwartung in a dramatic sense, although to my ears it never reaches the same frightening heights as the Schoenberg. (I would love to hear Karita tackle that piece - she has one of the largest and most passionate voices and would no doubt triumph). In the second half of the program, Karita entered wearing a black gown adorned with a diamond floral brooch and a silver shall. She sang Jean Sibelius "Three Songs" in Swedish. Karita has an interest in his music specifically because they are both Finnish. I loved these songs - "Autumn Evening," text by Viktor Rydberg, and "Arioso" and "Spring is Flying," both with text by Johan Ludvig Runeberg,(Sibelius' favorite poet according to the playbill notes). Karita recorded these on an all Sibelius cd in 1995. The natural imagery is evocative and again, Karita sang them passionately. 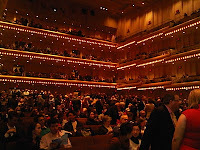 As the philharmonic was playing the last bars of the first song "Autumn Evening," in pianissimi, a cell phone went off. Maetstro looked over his left shoulder more than once then back at Karita - they seemed to share a moment of frustration and anger. It was priceless to see that, but once again I felt just as enfuriated - how is it that people forget that they have a cell phone? Fortunately, it didn't ruin the performance. The final piece of the philharmonic was Nielsen's Symphony No. 2, De fire temperamenter, Op. 16. It was nice, but felt long with four movements. I like sitting at the back for orchestra concerts so I can see the entire orchestra, especially the brass and percussion sections. But it was interesting sitting here for a change, watching the violinists at work.